Little master Sachin Tendulkar to spread the message of cleanliness in a short film which will be made by Asmita Chitra, a venture owned by Smita Talwalkar of the Talwalkar Group, as per Brihanmumbai Municipal Corporation (BMC). The film will show the level of cleanliness that the citizens should maintain in their surroundings and will also highlight the importance of keeping the metros clean. The 30-minute documentary will be ready by the next year accourding to the sources.According to BMC ,Sachin Tendulkar's appearance will create an impact on citizens and the message given by him will be taken seriously. Aamir Khan was approached but due to his prior commitments he was not able to do the film. 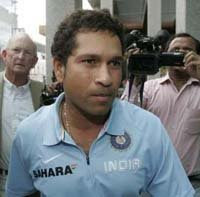 Later Tendulkar was approached and he agreed to play a role in the film. Once ready it will be shown in theatres.Its CDs and DVDs will also be available and they will be distributed in municipal and private schools and colleges," said a BMC official. Is there no latest news abt Tendlya? I am really enjoying the latest news about Sachin Tendulkar. You are posting the news in better way. Good luck to you. If you are a Big Sachin Fan, You must have a look at my web page, I am sure you will love it, because It has plenty of information about Sachin Tendulkar.